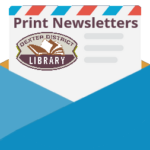 Show your Dexter District Library card and receive a free ice cream cone or cup from Joe & Rosie Creamery. Get creative in the Library’s lower level meeting room with a variety of crafts for all ages. Registration is not required.